I took this photo during our last trip to Las Vegas a few years ago. 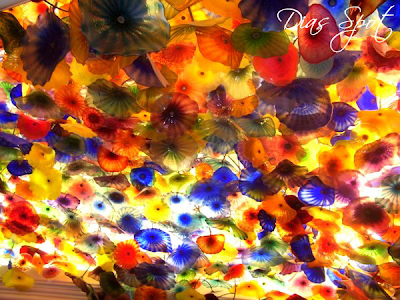 This beautiful ceiling cascades all around you inside the enchanting Bellagio lobby. Peer overhead and discover a ceiling adorned in a breathtaking display of 2,000 hand-blown glass flowers - the Fiori di Como. This gorgeous artwork is created by world-renowned artist, Dale Chihuly.